Pair of little animal models, owl and cat, handmade in polymer clay. Edward Lear's famous romantic couple, The Owl and the Pussycat, made small enough to keep in your pocket or bag or on your desk or shelf. Just 18mm high and gift boxed. Square pink new baby girl card with a cute image of an elephant blowing heart shaped bubbles. The image is overlaid on a pink patterned background together with the message 'A new baby girl!'. The card is finished with pretty pink gingham ribbon. Earrings featuring gorgeous ceramic spikes in earthy tones from Scorched Earth. White coloured seed beads are wire-wrapped over the top of the spike, and include a purple magnesite rondelle and a white sodalite round. The earwires are handmade from antique bronze wire. They measure 6.5cm from base of earwire. The earrings will come mounted on a pretty craft label in an organza gift bag. Three strands of glass crystals in delicate shades of blue, green and turquoise are shown in this necklace. The necklace measures 16 - 19 inches depending on where it is fastened on the extension chain. The clasp is sterling silver. The necklace will be supplied in a pretty organza pouch and will be posted via Royal Mail 1st Class "Signed for" delivery. A gorgeous vintage-inspired bracelet containing a handmade wire wrapped antique bronze bead, which includes pink seed beads. Rosary linked sparkly pink crystals form the chain. The bracelet fastens with an antique bronze lobster claw clasp. The antique bronze extension chain is 2.5cm long. The bracelet will fit wrist sizes between ~7-8cm. The wire bead is 3.5cm long. A6 ruled notebook with fabric reusable cover. Made from tiny pieces of fabric and then covered in organza with an attractive design using free motion embroidery and a variety of stitches. There is a ribbon fastening. Just the right size to pop in your bag. Beautiful earrings featuring gorgeous purple ceramic spikes with a galaxy-pattern made by Scorched Earth. Around the top of the spike are wire-wrapped pale pink seed beads, above which is a white glass flower bead. The earwires are gold plated decorated with a tiny heart. The earrings are 6.5cm long from base of earwire. Jadeite the rarer of the two minerals better known as Jade. Prized for it's beauty the range of green go from very pale to a dark green, a range of shades is exhibited in this bracelet. A hard stone it had been used in pre-historical times to make tools, know it as the prized gemstone of the Chinese whose jade carvings are well known. Using this lovely AB Red patterened disc shaped bead, I've added Tibetan silver bead caps & a red glass bead on to a stylish connector & a silver plated approx 18" rolo chain, which can be adjusted to suit, with hook & eye fastener. The drop is approx 4.5 cm from the connector. 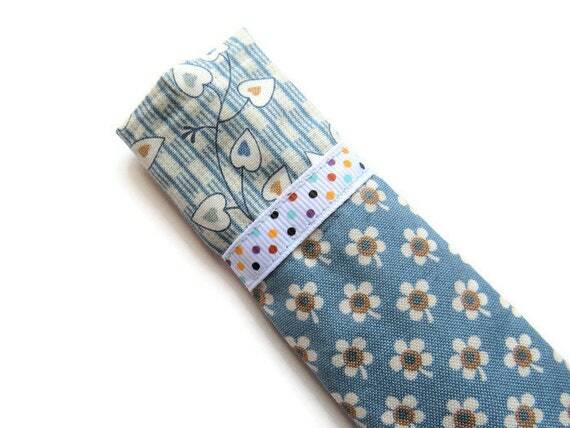 Crafted in a Steel Blue fabric with tiny flowers , this emery board case is lined with a heart design fabric ...you can see the fabric at the top of the case. The second case just has the fabrics the other way round. Crafted in a a heart design fabric , the emery board cases are lined with Steel Blue fabric with tiny flowers ...you can see the fabric at the top of the case. The sleeve has been finished with a polka dot ribbon, around the neck of the case. Crafted in a Steel Blue fabric with tiny flowers , the emery board cases are lined with a heart design fabric ...you can see the fabric at the top of the case. Three flowery lampwork beads are the main focus of attention in this necklace. The flowers are lemon yellow with a green background. I have found a lovely combination of green and yellow glass beads to combine with the lampwork and have finished the necklace with a lemon yellow tassel. This guitar Father's Day card features 5 electric guitars and is perfect for any music loving Dad. You can personalised the message on the front or choose from the photos shown. Just let me know at the time of ordering the message you would like.